My plan for a trip to South Queensferry today died on it’s backside when I discovered that the motorbike shop I wanted to visit (Forth Gear) was actually closed on Mondays. Plan B was swiftly thought up and Braemar was the new location. I had been up just the other week to shoot a wedding and the happy couple had shown me a couple of excellent places for a shoot. 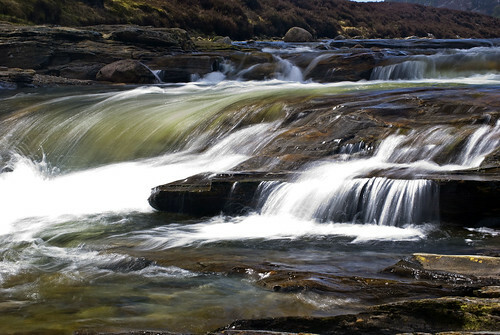 Linn of Dee is actually past the town/village and west of Braemar. There is a beautiful gorge with an old but well-kept bridge which is part of a private estate. The area itself is highly dangerous and there is a memorial stone which is a stark reminder of the dangers. After shooting a few snaps in the area I had noticed a couple of guys that looked mighty interested in the deepest part of the gorge. I then was aware of the mass bubbles coming up from the water’s depths. Turns out there was four scuba divers in there!! I have no idea what they were up to but it was certainly a bit of a surprise to say the least. The weather was up and down like a whore’s drawers but for the most part we were welcomed with plenty of sunshine. On a side note, if you are looking for somewhere to eat in Braemar we can highly recommend “Taste”, which is just after the art gallery! Soup and a sandwich for £5.50 plus an array of homemade cakes. Mmmmm cake….. Although I was dressed for the town shoot of Queensferry we ended up 100 or so miles further north instead! But even though my trainers were not the shoes I needed to be wearing and my jacket was not warm enough when the sun hid behind the clouds I still had a lovely trip and got some great shots without falling into The Dee. 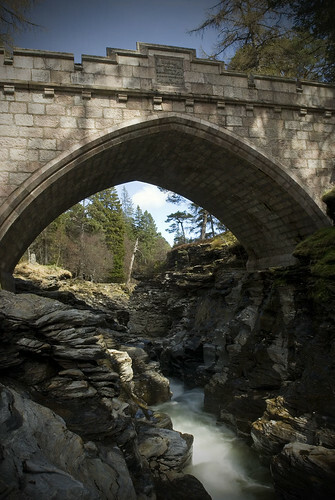 We headed down the back of Braemar to a big estate whose name escapes me, but they did have a great old bridge over an impressive gorge. We took turns to take shots and to look after the wee one who was full of beans! Somehow Ian got all the sunny bits and I got the rain showers to shoot in, Typical! But I worked in the raw format so manged to get some good ones. To be honest as I have no polariser for my wide lens as you can see the filter edge through the lens and also it is well expensive, I could not get low shutter speeds when the sun was out anyway, so the rain clouds weren’t so bad.I also managed to ping 50p down a very small hole when trying to take off my pod mount, a whole river and gorge and wide open space and I hit a hole about an inch wide! 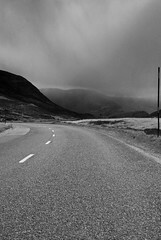 On the way back down the road at about Glen Shee the clouds proved useful again as they gave us a very dramatic view over the mountains which still had snow on them, even in May! So all in all a good day would recommend a return visit as the scenery is stunning and the cafe does great soup and cakes, yum yum!